No other product offers such precision. If you have a good ear, you will instantly appreciate what Drum Muff can do that others cannot do. 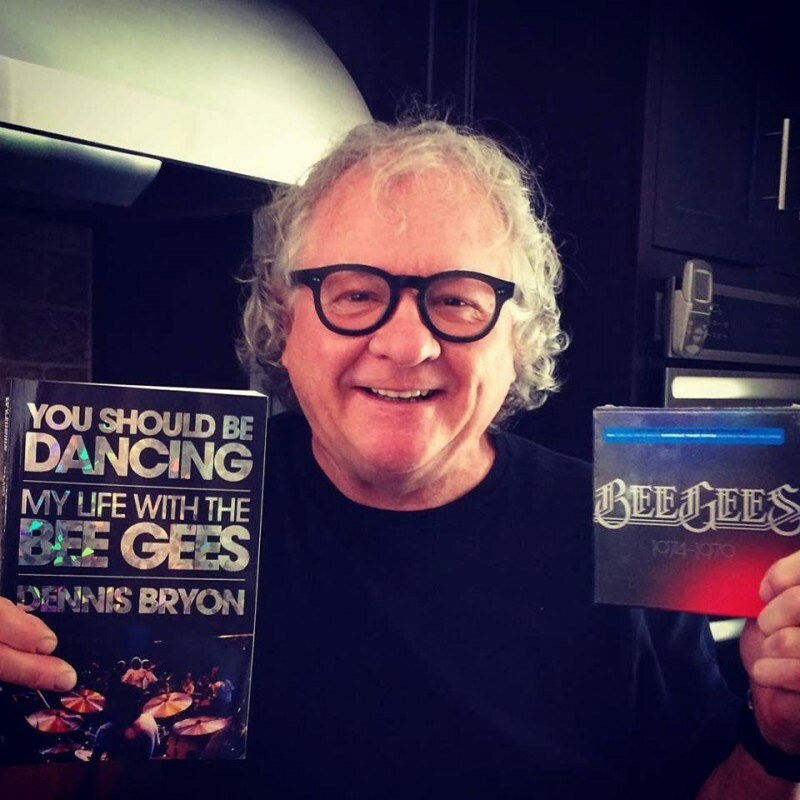 Dennis Bryon was born in Cardiff, Wales, Dennis started playing drums at the age of 14 and quickly rose to distinction among the local musicians. He went on to form the band Amen Corner with legendary guitarist Andy Fairweather Low. Amen Corner was one of the most successful European bands in the late sixties, with hits such as Gin House Blues, Bend Me Shape Me, Well Fly High In The Sky, If Paradise Is Half As Nice, Hello Susie, Living In A World Of Broken Hearts and At Last I’ve Found Someone To Love. Jive Talkin’, Nights On Broadway, You Should Be Dancin’, How Deep Is Your Love, Children Of The World, Stayin’ Alive, Night Fever, Love So Right, Fanny (Be Tender With My Love, More Than A Woman, If I Can’t Have You, Tragedy, Spirits (Having Flown), Too Much Heaven, Love You Inside Out and Desire. Barbra Streisand, Kenny Rodgers, Jimmy Hendrix, Andy Gibb, Jan Pulsford, June Pointer, London Philharmonic Orchestra, Nigel Pulsford, Jerry Lee Merritt, Tony Joe White, Michael Snow, David Schnaufer, Brian McDade, Jo Anne Kelly, Robin Gibb, Melanie, Barry Gibb, Cathryn Creig, Laura Taylor, Maurice Gibb, Kayte Strong, Brian Willoughby, Chris Pelcer, Dave Edmunds, Rhodes Charmers and Rhodes, Jimmy Ruffin, Ish Ladesma, Andy Fairweather Low, Yvonne Elliman, Richard Wold, Bill Lloyd, Steve Marriot. Daru Jones is one of the most respected drummers of his generation. Born in Michigan to two professional musicians, he began playing the drums at the age of four. Though he got his start in the church, Jones has been influenced by musicians from a wide range of genres. 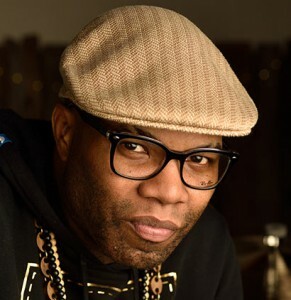 These eclectic musical tastes have carried over into his own career as he has recorded, performed, and toured with renowned artists and producers such as: Jack White, Nas, Talib Kweli, Black Milk, Salaam Remi, Lorenzo Jovanotti, Sturgil Simpson, Kim Burrell, Rance Allen, Esparanza Spalding, Black Violin, Ski Beatz & The Sensei’s, and Jon B (partial list). Alongside these artists Jones has graced the stages of some of the most revered events in the music industry, including: One Mic: Hip-Hop Culture Worldwide! A 20th anniversary celebration of Nas debut album Illmatic, the 2013 Grammy Awards, Austin City Limits, Rock The Bells Festival, and the Montreux Jazz Festival. Receiving rave reviews from: Rolling Stone Magazine, LA Weekly, and USA Today (partial list), he has also appeared on several national and international television programs: The David Letterman Show, Jools Holland (UK), The Colbert Report, Saturday Night Live, and MTV. 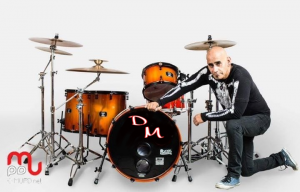 Dave Stark is a highly in demand session and touring drummer, as well as one of the world’s top drum instructors and clinicians. 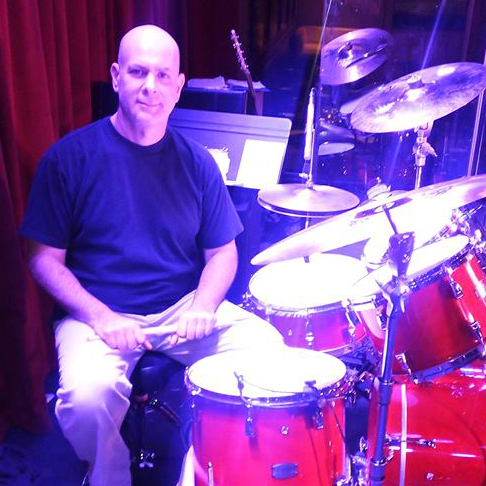 He’s been playing music since the age of 5 and drums since the age of 7.Born and raised in New York, Dave studied with legendary teachers Dom Famularo, Jim Chapin, Al Miller, Frankie Malabe, Gary Chaffee and an abundance of other great drummers. After attending Berklee College of Music on a scholarship, Dave’s career took off quickly back in NYC where he became a first call session artist. He also started a teaching career which to this day, has many top drummers seeking out his advice and guidance. For over 25 years, Dave has traveled around the world doing clinics for Zildjian, Yamaha, and ddrum/clavia. 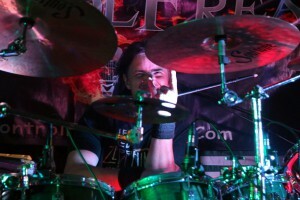 He proudly endorses Zildjian, Vic Firth, Evans Drum Heads, GMS Drums, TruTuner and Drum Muff. Visit his facebook page. Marc Frigo is a Multi-Platinum Mixer / Recording Engineer with over 25 years experience, working on projects with artists such as The Indigo Girls Jewel, Future Leaders Of The World, Israel, Nicole C. Mullen, Letters to Cleo, KT Oslin, Jackie Chain, and many others, and has engineered and/or mixed sessins with producers including Dez Dickerson (guitarist for Prince and the Revolution), Jay Joyce, Peter Collins & Alain Mallet to name a few. 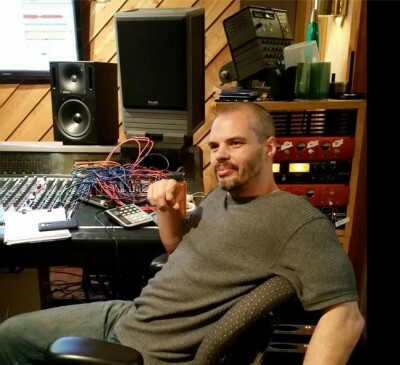 Marc’s passion for recording and mixing helps bring out all the depth, space, and emotion in each and every song through creating the most amazing mixes possible for his clients. Marc is based out of Nashville, TN, and works with incredibly talented artists and producers from all over the world. Once I heard the difference Drum Muffs make, I decided I don’t want to mic up a kit without them. I’m amazed at how they help me control and enhance the tone of the drums. Using them on the cymbals helps keep cymbal bleed into the close mics down to a minimum, and allows for a better balance of drums and cymbals in the overhead and room mics, making things much easier when it comes time to mix. I also love them in live settings, where I use them to not only help enhance tone, but to keep the stage and room volume of the kit down a notch in smaller venues. Truly a game changing product for me! Attending Berklee College Of Music on a full scholarship from 1993 to 1996 Steve was asked to join the Ravi Coltrane Quartet. He toured and recorded with the band from 1996 to 2002. The music was a mixture of traditional jazz, funk, and odd meter fusion. During this time Steve was also a studio drummer in New York City playing on dozens of national jingles, record dates, television shows, and movie soundtracks. He was also a member of Ruben Wilson’s “Masters Of Groove” where he shared the drum chair with the legendary Bernard Purdie. In addition, during this period Steve toured with Christian McBride, Suzanne Vega, Miri Ben-Ari, Bob Berg, and Richard Bona amongst others.In 2003 Steve began touring and recording with multiple Grammy winners and Atlantic recording artists, The Manhattan Transfer. He remains the first call drummer for The Manhattan Transfer, and works with them as his schedule permits. He is the first touring drummer in the history of the band to actually record with them. He is featured on 3 album releases and 1 live concert DVD.In late 2003, Hass released a solo album named Traveler. The C.D displays Hass’ skills as a talented producer. His usage of sonic layering and drum loops is reminiscent of Jon Brion. In 2005 Steve joined John Scofield and Mavis Staples to support Scofield’s Verve release “That’s What I’d Say”. The band toured around the world from 2005 until December 2007 playing R+B, Soul, Jazz and Latin. Scofield also used Steve in his jazz trio, along with bassist John Benitez for select local N.Y dates. 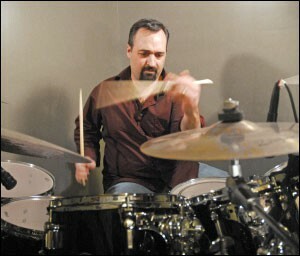 In 2006 Hass had an eight-page feature interview in Modern Drummer Magazine. He is now a regular educational contributor in the “ask a pro” and “workshop” columns. In 2007 Steve established a second residence in Los Angeles and quickly became a popular choice for musicians and producers on the L.A scene, both live and in the studio. 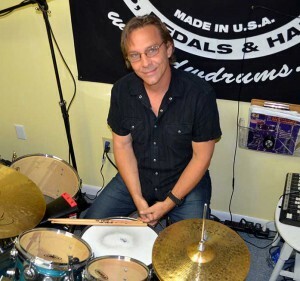 His company Hassbeat Productions Inc. provides studio services to artists worldwide while allowing Steve to record drum tracks for a variety of artists around the world. He continues to tour with a variety of artists. Since moving to Los Angeles Steve has become a regular with renown artists such as Billy Childs, Bob Sheppard, Brandon Fields and Alan Pasqua as well as maintaining his presence in the studio with contemporary rock singer/songwriters. 2012 has been his busiest year yet juggling recording sessions for producers The Difference, Rami Yadid and Ken Wallace and tours with R&B great Patti Austin, top selling fusion/new age pianist Keiko Matsui and The Manhattan Transfer. He continues to work with R&B/Jazz Grammy winner Patti Austin in all variations of her touring band. Benatar, Brian Littrell (Back Street Boys) Britney Spears, Martina McBride, Tim McGraw, Greg Howe, Gloria Estefan and many more. 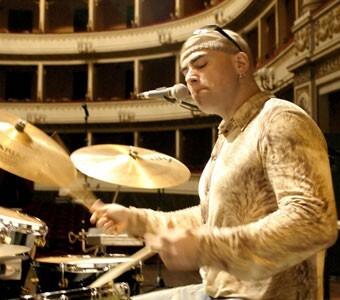 He has also performed at the Modern Drummer Festival ‘02, PASIC ‘01 and NAMM ’05 & ‘07. His experience has led to over 60 television appearances including The Tonight Show (6 times), Saturday Night Live, MTV Music Awards, Grammy Awards as well as HBO & Pay Per View Concert Specials. Starting in May ’06 Billy spent nearly two years as Head of Education for the drumming website DrummerConnection.com. 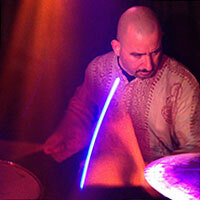 During his work there, he posted over 250 online drum lessons available free to site members. entitled “New Sounds” and “Atoms and Space”. In October ’13 he opened his own teaching studio in Saint Cloud FL. He currently teaches there full time with a consistent student count of 60 plus per week. Billy proudly endorses DW, Paiste, Evans, Vic Firth, Drum Muff and E-Pad. He is also an Alfred Publishing artist with his DVD entitled “Takin’ Care of Business”. Jonah is a 10 year old self-taught drummer. He’s never had a lesson, and plays songs as he hears them, and how he thinks they should sound. He doesn’t “play it like the record”, he plays his way. He doesn’t have to learn how to play a song; he just has to hear it. 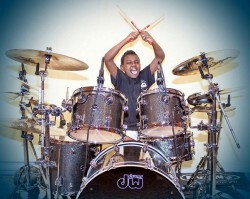 Jonah spends between 1 – 2 hours per week playing drums. Jonah started playing drums when he was 3 years old. At first we thought it was cute, but soon realized that there was something going on here. He wasn’t just making noise, he was making music. Within a few weeks, he was playing covers of his favorite songs. It was so cool, we decided to put a few of his vids up on YouTube. People began watching them and sharing them. In no time, he had developed a large following. When Jonah was four, Craig Northey, Doug Elliott, Pat Steward and Murray Atkinson of the Canadian band Odds, came to visit Jonah and *play band* with him in the basement. It was a rockin’ good time that he will never forget. Jonah is proud to call them his friends. In January of 2010, Jonah’s System Of A Down’s Toxicity cover went viral. The video received over 1 million hits in one day, and over 3 million in 3 days. We could not keep up with all the emails we were getting. Jonah’s video was shown on evening news programs all over the world. We were contacted by every talk show, news program, etc., inviting Jonah on television. We graciously declined. When he grows up, he can make those decisions himself. For now, he’s just a little boy who loves to play the drums, among a lot of other things. Jonah has been very fortunate to have been invited to meet Eric Singer of KISS and fellow band members a couple of times. He’s met Mickey Curry, drummer for Bryan Adams as well as Bryan and fellow band members. In September 2011, Jonah was invited by Travis Barker to come and meet him in Vancouver, BC. Jonah spent an awesome afternoon hangin’ with Travis and company, playing drums and flying around the arena on Travis’ flying drum kit. 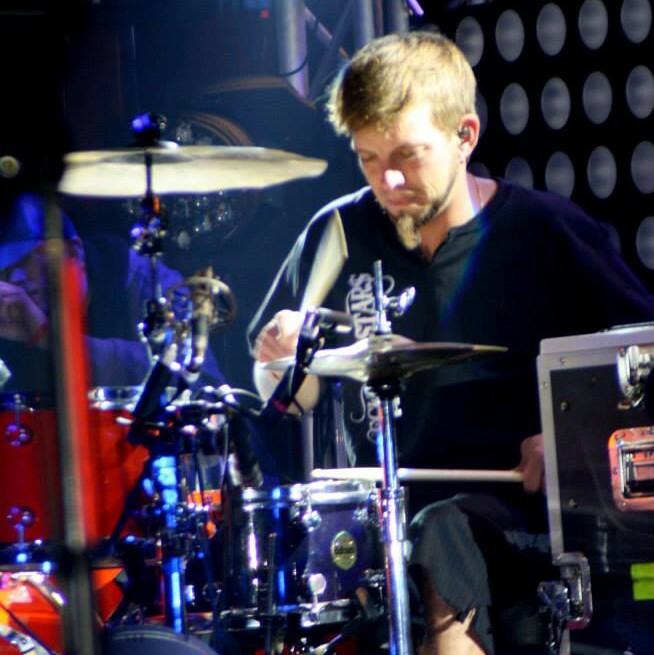 That evening, he attended the Blink-182 concert, but not as a member of the audience – Travis had Jonah on stage, playin’ drums! Jonah met some of his favorite drummers that day; Jay Weinberg (Against Me), and Branden Steineckert (Rancid). March of 2013 Jonah finally got meet his friend Dan Moyse and Sum 41. He had a great time jamming with the band at the sound check! Drum Muff is the answer to any problems with unwanted tom ring and ideal for recording in my studio. I use them on all Jonah’s toms and his snare to control and deaden the drums just the way I want them. They work Awesome! I also use Drum Muff on Jonah’s high hat. I have tried other products and they do not compare. They are so easy to use and are a quality product. Once you try them you will never go back to whatever you used before. Like many drummers, Barry began playing when he was 8 years old. A couple of years later, he saw KISS on TV and was taken by the amazing spectacle, making a commitment to becoming a rock ’n’ roll drummer. At age 12, he got his first paying gig playing for a large international choir at Carnegie Hall in New York City. After high school, Barry studied with Dom Famularo. While teaching at the Long Island Drum Center, he took lessons with other drummers, teachers, and authors, such as Jim Chapin, Chad Wackerman, Gary Chaffee, Rick Latham, and Willie Ornelas. Barry then landed a gig with Howard Stern’s infamous interviewer, Stuttering John Melendez. This band toured relentlessly for 2 years up and down the east coast and appeared several times on Howard’s television show. The band also got to open up for some notable acts such as George Lynch’s Lynch Mob and Enuff Z’nuff. He attended S.U.N.Y. Buffalo and The City College of New York, where he studied music & percussion with professors Jan Williams, Tony Miranda, and jazz legend Ron Carter. Barry earned an M.A. in music and music education from Teachers College at Columbia University. In 2010, Barry began writing songs with The Turnback. They released the CD Drawn In Chalk, the soundtrack to an indie film called Drawing With Chalk. Currently, the band is mixing their second CD, appropriately titled “Are We There Yet?” Details to follow. 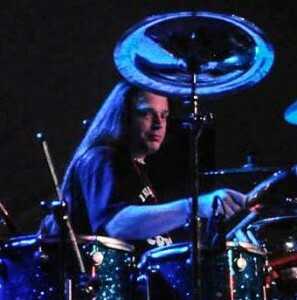 Barry also plays with An Ultimate RUSH Tribute, New York’s premier authentic, 3-piece RUSH tribute band. For the past 17 years, Barry has been a high school music instructor and band director for a public school in Brooklyn, NY. One by one the teacher asked each kid to make a sound out of their respective instrument’s mouth piece. If you couldn’t make a sound, then the teacher would go ahead and assign an instrument for you. I watched in horror as my friend who chose clarinet got stuck with the tuba because he couldn’t produce a sound out of the mouth piece! That was me at 8 years old, and as you can see I began studying drums quite by accident. My first instrument choice was actually clarinet. I never got into the clarinet, but quickly grew to love the drums. I started private lessons at the age of 11. That first year, I practiced on a mishmash drum set, made of a beat up set of bongos, some old pots and pans, and my biggest score… an old beat-up snare drum that I found in my buddy’s attic. Eventually, my folks broke down and got me a real kit. I Got Blindsided By The ‘Harsh Reality Of The Music World’ And It Nearly Ended My Career Before It Began. At my audition for college the department was only accepting three new freshmen since there was a cap on the jazz program (75 students at the time)… and they already had plenty of drummers… or so I was told. Feeling like I was about to blow the audition, I knew I had to do something drastic. So toward the end of a standard blues progression I closed my eyes, grit my teeth and through down the fastest, craziest fill I could possibly do. The solo was furiously out of control and I was totally lost in the count. However, Somehow… by the grace of God himself, I crashed the cymbal and came in on the correct beat! However once the school year started, the truth was revealed. The teachers quickly realized that I was a fake who had a miracle audition, not the prodigy they were hoping for. I couldn’t duplicate that miracle again. They weren’t allowed to kick me out of the program, so instead they tried to get me to quit by really giving me hell in all of my classes for 2 years. It was from sheer white-knuckled panic that by my junior year I had outworked my entire class to survive and prosper as a top player in my school and later as a professional drummer. I reached all my goals and blew past all my ceilings because I didn’t have a choice. I was forced to find the answers… and I did! I went on to become the head instructor at The ‘Ratamacue Percussion Learning Center’ in East Northport, NY for 3 years and then later opened the J-Sonic Music Studio in Amityville, New York. I now lives in Atlanta, GA and works from my studio there. I keep a busy schedule teaching online, performing and recording with various artists as well as creating new content for the thedrummersalmanac.com … My interactive website to help drummers practice more effectively. From 1995-2003, I played drums in the NY based rock band Halfmanwonder, touring and opened for major acts like The Dave Matthews Band, SR71, The Smithereens, David Crosby, Spearhead, Sugar Ray, and Derek Trucks until our interminable hiatus in 2003. From 2007-2014, I was the drummer for the jam/fusion band Scogeojam a tribute to Chick Corea. From 2010-1014, he was also the music director for Nocturne Orchestras, performing at corporate events all over the world for companies like Volkswagen, Emagine It, Moody’s Investors Service and Hard Rock Casinos. Currently I put most of my efforts into bettering Thedrummersalmanac.com, to help a broader range of aspiring drummers all over the world organize and develop their drumming skills. Pro New York / North Carolina session drummer Tarik Ghiradella has become highly sought after in the recording studio. His solid feel and flexible style make fun and easy to work with. He brings energy and enthusiasm to every record he records on. Tarik is the exclusive session drummer for world famous producer James Lugo at Hemisphere’s Studio. He has recorded Drums for countless artists including Grammy nominated singer/songwriter Nicki Kris. While keeping a busy recording schedule, Tarik still finds time to teach private drum lessons, records a monthly video blog for the Progressive Music Center, peforms regularly with his band The Rebel Yells and is currently finishing up his first drum method book The Drummer’s Tool Kit. At the age of 8, Dean Andrews Jr. Began what has become a lifelong journey by studying a wide variety of drumming styles, Rock, Pop, Jazz, Hick Hop, Rudimental, Electronic are just a few examples of Dean’s extensive and vast knowledge of the drumming world. Not long after relocating from New Mexico, Dean at the age 13 was playing live and recording with numerous highly recognized Orlando bands. Such as Jennyanderson, Some Other Life, Von Ra, Canvas, Am Conspracy. Am Conspiracy was fronted by Jason Jones ex front man of Drowning Pool. Currently Dean is on tour with national recording/ touring artist The Lacs. Country/ Hick Hop pioneers! With a new album release 2015 and solid tour schedule. This is just one of the many works that Dean will be involved in this year. Keep your eyes and ears open for what’s to come!!! Shawn has been the “beat” for central Florida’s perennial powerhouse group “ICED DOWN” redefining the central Florida music scene. 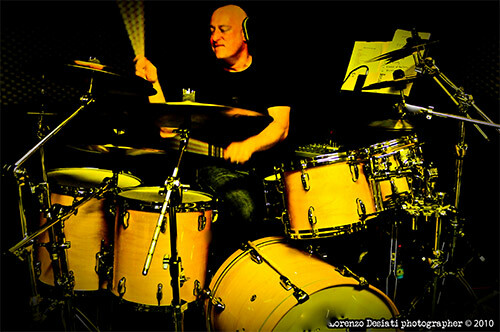 Shawn has shared the stage with such drumming greats as Bun E. Carlos, Sandy Genarro and Cosmo Clifford. He has also opened for many national acts including, Cheap Trick, Eddie Money, CCR, Pat Travers, Warrant, Vince Neil, Spin Doctors, Huey Lewis and Loverboy. Shawn now takes the stage with BLACK CANVAS setting the groove for their new style of music. Black Canvas has recently released an EP and an additional single all available on iTunes. Shawn manages the product development team of a Fortune 400 company, geek by day, rock star by night. 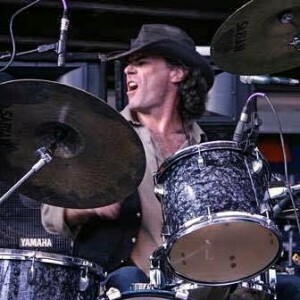 Fran Merante is a highly experienced live and cyber session drummer from the Greater New Haven, Connecticut area and has been playing drums now for over 33 years. If you ask him, he’ll tell you the most important of those years were the ones he spent at the Berklee College of Music where he honed his drumming skills and teaching concepts. 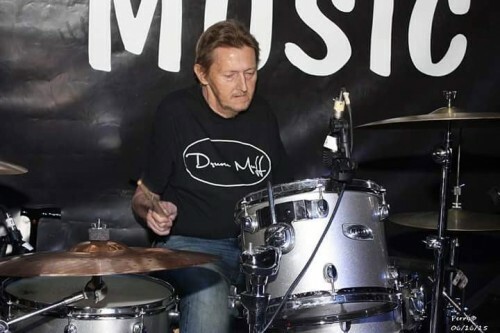 Fran has worked in many facets of the drumming industry, from studio work, to off Broadway musicals, to original and top 40 gigs, to headlining gigs with his former band, Cubistic Jack. He has played such venues as, Toad’s Place in New Haven, CT, Fat Daddy’s in Watertown, CT, The Oakdale Theater in Wallingford, CT, Foxwoods Casino in Ledyard, CT, Le Bar Bat in Manhattan and The Bitter End, Greenwich Village. While with Cubisitic Jack he also worked with musicians from Blood, Sweat & Tears, The Buddy Rich Big Band and the Arturo Sandoval group. In addition, Fran played with Styrocultural Antidote, an original “Progressive Fusion” trio powered by the composing and guitar playing wizardry of Ron Neuhauser. In this setting, Fran was free to create and progress as a player. To date, he feels that this was the setting where his drumming was most pushed to its outer limits. He also served as Drum Technician for New England Sound Company and worked with the Woody Herman Orchestra, The Arturo Sandoval Band, and Jack Jones. Since 2008, he has recorded virtually hundreds of tracks for a multitude of musical genre’s. Currently, he is working with producer/engineer Bobby Parrs of Bobby’s Backing Tracks, providing drum tracks for his world class backing tracks. Fran has played on tracks with such talents as, Jack Thammarat, Matthew Charles Heulitt, Jeff Pevar, Steve Kindler, Vinai Trinateepakdee, Pianismo, Chuck D’aloia, John Findlay, and David Steele. You can find his instructional and performance videos on YouTube which have earned over 900,000 views and over 2000 subscribers to his channel. Fran also teaches private lessons out of his home studio and is also available for lessons via Skype. In addition to his full teaching and recording schedule, Fran also manages to play live, weekly, with one of Connecticut’s Premier Jazz performers, Steve D’Agostino. As a drummer/engineer, Sean has made music with artists like Molly Hatchet, Billy Payne (Little Feat), Pat Travers, Brian Howe (Bad Co.), Les Dudek, Rob Rock, Impellitteri, Charlie Daniels, and many others, and has worked on records with producers Dennis MacKay (David Bowie, Judas Priest), Malcolm Springer (Collective Soul, Faith Hill), and Steve Thompson (Guns n Roses, Metallica).Sean studied audio production with Dave Moulton and percussion with Dr. Theodore Frazeur at SUNY Fredonia’s Tonmeister Program, then found himself in Florida running sound for Sea World. He ended up meeting and working with great musicians like Pat Travers, Molly Hatchet, Les Dudek, Brian Howe, and many others by getting to work making records and building studios. 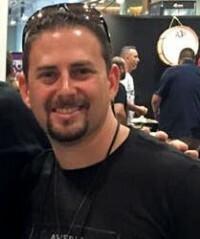 Sean founded The Mixing Workshop, an audio ear training and mixing course for audio engineers, and writes articles about mixing for Recording Magazine.Sean co-wrote and mixed the single “Home To Me” for Outbound Road (“Hard Country” 2012), which spent 21 weeks on the charts, reaching #2 on the Top 30 Indie Charts. He also performed on and engineered Pat Travers’ Blues On Fire (2012 Cleopatra), which made it to the top 5 on Amazon’s Blues Chart, and produced and performed on the 2013 Pat Travers CD “Can Do” for Frontiers Records. Swan is also DW Drum artist. Rocky was born in Fall River, MA, moved at an early age to Milpitas, CA. He began playing drums at the age of 10, later playing drums in his high school Jazz, Marching, and Concert bands. After graduating from high school, he joined a local Rock band and toured throughout California. In 1986, Rocky moved to New Mexico and joined a touring Country band and performed at numerous venues. During this period he opened for many international acts such as Keith Whitley, The Bellamy Brothers, Sawyer Brown and many more. In 1990, he moved to Tulsa, OK, joining regional bands, performing several different styles of music. In 1996, Rocky joined Country artist Joe Nichols and began touring extensively as his drummer. That was Rocky’s first band membership in support of a soon-to-become Grammy-nominated Country star. After touring all across the U.S. with Joe Nichols for a little over two years, being seen on “CMT” and other country music channels in Joe‘s first three music videos, Rocky made a decision to stay closer to home in order to help raise his son, while continuing his live performing in and around Tulsa. 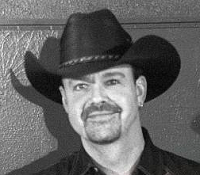 In 2003, Rocky joined Country legend Johnny Lee and The Urban Cowboy Band, to which he recently left after almost 11 years. Rocky has performed at the world famous Grand Ole Opry in Nashville, TN, and many other notable venues. He has shared the stage with many Country artists and legends such as Loretta Lynn, Merle Haggard, John Conlee, Restless Heart, Highway 101, Lacy J. Dalton, Johnny Rodriguez, and Gene Watson, to name a few. Emmett started playing the snare drum in the seventh grade, then marching band in the eighth. By the time high school hit, his parents had bought him an old Vistalite Ludwig kit ( which he still owns ) and the rest is history. Over the course of his career, Emmett has been fortunate enough to play in some of the best venues around. House of Blues multiple times and The Hard Rock Live just for a sample. He has also recorded four albums, nine demos and a soundtrack in the Orlando area. In 2012 he was flown to Los Angeles to record with an independent artist there. He taught at a local music store chain for four years and still teaches privately. Emmett is also very charitable with his talent. He co-hosts a Drumathon for Muscular Dystrophy every Labor day. 24 hours of drumming, non stop. This task is shared between six to eight drummers with Emmett putting in the majority of the time himself. He now is in a band called Control Freak and plays nearly every week. 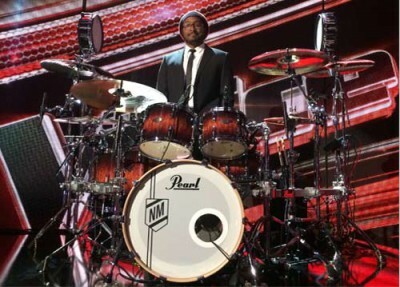 He is in very high demand and recently won the Orlando Sam Ash Best in Drums Competition (2011). His passion for playing drums is unmatched by any of his peers. He literally eats, sleeps and breathes playing drums. His versatility, speed and showmanship makes him one of the best around. Mike started playing drums as a teenager and turned pro in his mid 20’s. Mikes hard hitting style has landed him gigs with the top metal,rock, and pop local acts and recently with national touring act Inside Riot. 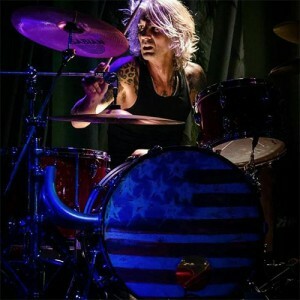 In the last two years alone, he has two national tours, two recorded albums, official videos, a rockumentary, radio and television appearances,has been featured in local newspapers and international music magazines, has drum and cymbal endorsements and has performed live over 200 times from 2013-2015 opening for acts such as Everclear, Rival Sons, and Three Days Grace! “Sofia started playing drums at the age of 14. Her music teacher ,Claudia Keller, one of the very few female graduates of Berklee College of Music in her class, saw her passion and recommended her to Berklee. 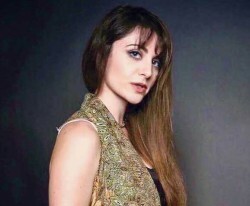 It was at Berklee that Sofia’s music career began, in Boston, where she was exposed to the exceptional musicians and teachers attending and teaching at the highly esteemed college, that is currently ranked one of the best music schools in the world. At Berklee, Sofia was fortunate enough to be placed in an ensemble taught by Esperanza Spalding, now a Grammy award winning, and extremely talented jazz artist. Some of you may remember the outrage when she won the grammy for best new artist over teen pop sensation Justin Bieber. Sofia learned a lot from playing with Esperanza in the ensemble and is very grateful to have been fortunate enough to have the experience with her. She was also fortunate to experience the Tuesday funk night at Wally’s Jazz Cafe in Boston. The house band’s members have played professionally with Brian McKnight, Beyonce and Chaka Khan amongst many others. She sat in with the band and advanced her musicianship. She was also taught by Jackie Santos (Tavares, Chuck Berry), Rod Morgenstein (Dixie Dregs), Tony Thunder Smith (Loud Reed), Kim Plainfield (Pointer Sisters, Tania Maria) and Kenwood Dennard (Prince, Miles Davis). Sofia graduated with a degree in Performance in 2012 and shortly after moved to Nashville, TN. Since in Nashville, she has performed professionally with Andy Gibson, who wrote the number one hit “Don’t You Wanna Stay,” Regi Wooten, guitar legend and brother of bass virtuoso Victor Wooten, and in 2013 she was selected to perform at the Poretta Soul Festival, in Poretta Terme, Italy, where she backed soul legends, Toni Green, Latimore, grammy nominated blues artist, Bobby Rush, David Hudson, Sax Gordon, Falisia Janaye, and Charlie Wood. She gained many fans in Italy and received a terrific review from Tony Rounce of Ace Records from the festival, whom called her playing “brilliant” and compared her to some of the greatest soul drummers of the 60s and 70s and credited her precision behind the kit, playing 4-5 hours every night at the festival. In 2012 she performed at Bonnaroo with world rock fusion band HuDost, and she recently recorded in 2014 on their album “The Word is Love,” which features Jon Anderson from Yes and Steve Kilbey from the Church. She recorded on 4 tracks on the album, one which included Jon Anderson, at Velvet Cinema Studios, owned by the very successful Michael Whittaker. She has done studio work at his studio as well and respects Michael very much. She is also grateful for having the honor to work professionally with Ella Mae Bowen, Guns of Navarone, Andre Vasconcelos, Stacy Mitchart, Tim Gonzalez, RB Stone, PULSE, Jazz Frost, Rheal Janelle, The Nick Carver Band, and many more. She also works as a drum instructor, and currently teaches 30-35 students a week. Born in Geneva, New York, DiDuro learned to play drums at age 5. He played with various local bands during high school, including a band called “Madden.” He moved toOrlando, Florida in 1991 and played with Andrew “Duck” MacDonald in the band Playground for 5 years. He joined The Kill in 1997; in 1998, the Kill won a contest called “Kick Start Your Career,”  which was a Battle of the Bands-type competition that the band Mötley Crüe was sponsoring; one winner in each city got to open for the Mötley Crüe show- the Kill opened in Orlando. The Kill also won the 1998 Orlando Music Awards for best Metal Band. They released one album  on Forbidden Records in 1998. He then played with Brizz (one of the original founding member of the band Lyte Funky Ones[LFO]) from 2001-2003. In early 2004, he replaced Skid Row‘s drummer Phil Varone, who had abruptly left the band, citing personal reasons. He also appeared in the Skid Row video “Ghost.” In late 2004, he auditioned for Slaughter and played until 2011, but he still remains their temporary touring drummer. He has also played with Vince Neil, and Mark Slaughter‘s band Scrap Metal. Scrap Metal consists of Mark Slaughter and otherplatinum-selling singers such as Gunnar Nelson (Nelson) and Eric Martin (Mr. Big). Timbo is currently playing with Pipestone, which is a five piece heavy rock band from the Florida area. Collectively the band members have had 5 number one radio hits and have toured the United States extensively with other projects. The band is currently recording their first CD with producer Brett Hestla (Dark New Day/Framing Hanley) which is slated for release later this year. 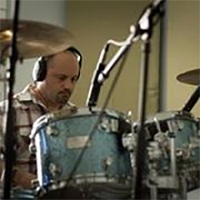 One of today’s top players, New York-based John Favicchia has performed and/or recorded with such greats as Special EFX, Steve Khan, Eddie Money, Tony Levin, Chieli Minucci,Charlie Daniels, Lonnie Plaxico, Robbers, John Benitez, Gary US Bonds, Harvie S, Larry Coryell, Dean Brown, Rachel Z, Joe Butler-Love And Spoonful, The Tokens, Felix Cavaliere, Kerry Kearney, Chris Geith, Laco Deczi, Long Island Music Hall Of Fame Band, Mike Pope, Noam Lusterman, Steve Adelson, and Bob Malach just to name a few. Known for his extreme versatility, in the course of a week John can be seen drumming from NYC Jazz Clubs to Rock Concert halls to International Drum Festivals as well as the top Music Festivals around the world. His band Dharma All Stars blends various styles into a powerful blast of fusion that spans the extremes of the dynamic range, Favicchia has been busy touring and recording as well as stepping up to the plate with his own solo releases. His debut, World Time, earned rave reviews and was a Top 10 Critics Pick of the Year in Jazziz Magazine. The latest, Dharma, offers an intriguing mix of melody, eclecticism, and tight ensemble playing with the likes of all-star guests including Khan, Brown, Swartz, Dave Mann, and Chieli Minucci. Favicchia is all about the mindful side of playing drums of making music from the mind, for the mind. Definitely, he says, It’s all about the soul and the mind, but it’s very visceral as well. I’m caressing the sounds out of my cymbals in one bar, but when the music takes off and I start to wail, I take no prisoners. 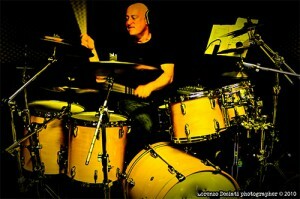 Said Mike Lomonaco, Just Drums, Toronto: John Favicchia is great. He’s a dynamic, very involved player who blew us all away with his great playing and personality. John Endorses: Yamaha Drums, Sabian Cymbals, Vic Firth Sticks, Remo drum heads. L.P. Percussion, Hansenfutz practice pedals, Axis pedals,Real Feel Pads, DrumFun, Beatnik, Drum Muff, Factory Metal Percussion, KickPort,Tune-bot and Samson Mics. Growing up with the drumming influences of John Bonham, Neil Peart, and other rock drummers, Brian enrolled at Berklee College of Music in Boston, where he was introduced to jazz and fusion by his instructors John Ramsey and Tommy Campbell. After leaving Berklee, Brian was immediately busy as drummer for live shows and studio sessions, including engineering and co-producing many of them. Over the years, Brian has performed and or recorded with Hilton Valentine (The Animals), Bobby Lee Rodgers (Col. Bruce Hampton and The Codetalkers), Jay Stollman and Scott Spray (Johnny Winter Band), and many others. He continues to tour and record as an independent session artist. Self-taught from age 4, Nate’s formal drum set training began during high school with Grant Menefee in Baltimore, Maryland. He continued his education in Boston, Massachusetts as a performance major at the renowned Berklee College of Music, studying with drummers such as; Gary Chafee, Ed Urbine, John Ramsay and Ian Froman. After graduating from Berkee in 1994, he taught and played locally in Boston until moving to Los Angeles in 1999 where he has since amassed touring and recording credits that include Natalie Cole, Michael Bolton, Madonna, Miley Cyrus, Richard Marx, Paul Anka, Paul Stanley, Ping, Paulina Rubio and Thalia among others. He was also the hard hitting force behind the house band on the Mark Burnett series, ROCKSTAR:INXS and ROCKSTAR:Supernova. He cites Animal from the Muppet Show as his first and biggest influence. 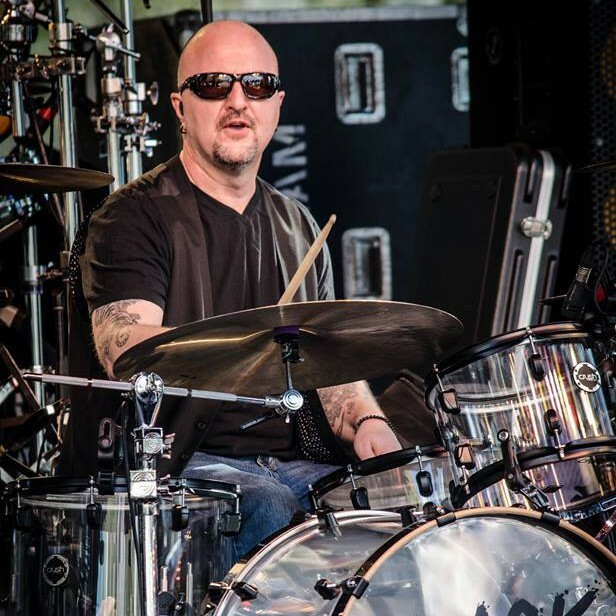 Recently, he was the drummer in the house band on the daytime talk show, The Bonnie Hunt Show, as well as Cher’s drummer for her string of appearances at The Colosseum at Caesars Palace. Now, you can catch him grooving during prime time on NBC’s hit show, THE VOICE.